How do you benefit from the Magento Payments extension? iDeal, Credit card, PayPal, AfterPay, Bancontact, Sofortüberweisung, Wire transfer. CM has years of experience in mobile payments and is a trusted partner for payments by government and banks. No need for a custom and costly solution to integrate CM Payments within your Magento platform. Easily install the Magento extension to add CM as your payment provider. The CM payments extension is used by a large number of webshops. When it comes to money, better rely on proven technology. 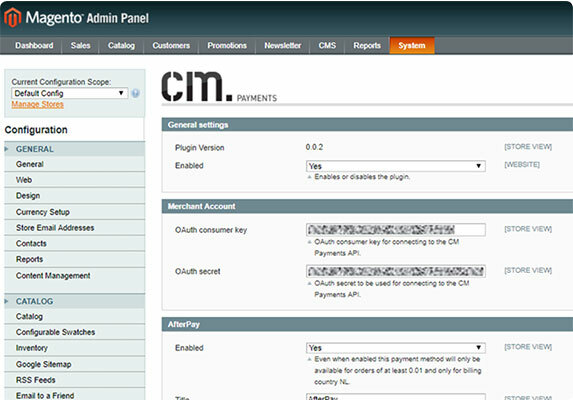 The CM Payments extension for Magento 1 enables you to integrate CM as your payments provider in your Magento web shop. Combine the ease of use for the consumer and fast payouts for you as the merchant.